Taxes are something every American pays at some point in their lives – they’re inevitable. 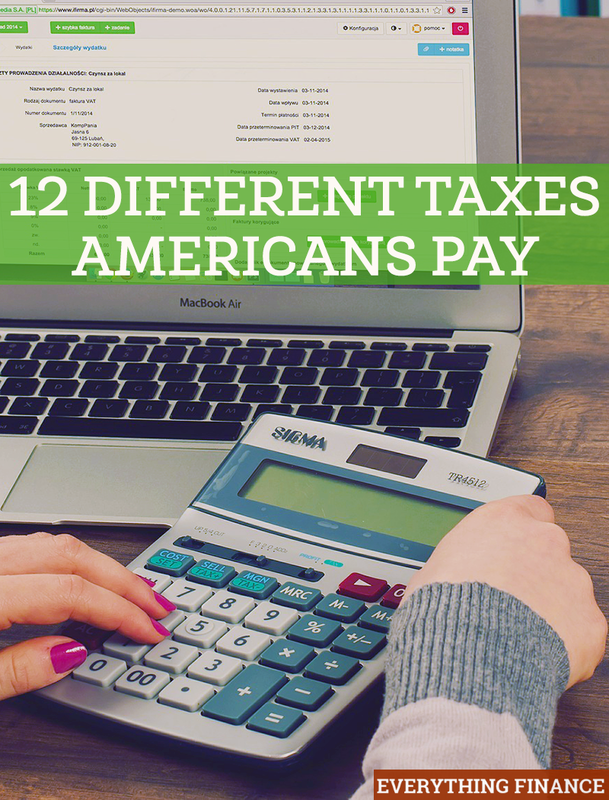 Today, we’re taking a look at all the different taxes that Americans pay on a daily basis. Whenever someone thinks of taxes, they usually think of federal income taxes first. That is because between Federal and State taxes, some Americans lose as much as 35% of their paychecks to income taxes. Also known as corporate taxes, business taxes are direct taxes levied on the profits of businesses. However, expenses that are deemed necessary to the business can often be deducted to lower the amount of profits subject to tax, some business opt for the eis scheme option that helps them raise capital in a faster way. Property taxes are imposed on property by reason of its ownership. They are usually paid on real estate, but can also be paid on personal property, such as boats, automobiles, recreational vehicles, and other business inventories. These are the taxes that must be deducted from wages paid to employees, and the employer usually must match the amount taxed. Some payroll taxes include federal withholdings, disability insurance, Medicare, and other state withholdings. The inheritance tax, also known the “death tax”, is a tax that arises from the death of a taxpayer. It is imposed on the transfer of any property or asset transferred as the result of a death. In the United States, a tax is levied on all income generated from a taxpayer’s capital gains, which are profits from the sale of an asset that was purchased at a lower price. The most common capital gains are created from the sale of stocks, bonds, and property. Any tax that is based on the value of the product being taxed is considered an excise tax. They are based on the quantity of the product. Common examples include those levied on gasoline, cigarettes, taxes, and even those on CD-R’s and DVD-R’s that are paid to copyright owners. Consumption taxes, also known as sales taxes, are levied at the point of purchase for specific goods and services. It is usually a percentage determined by the levels of government charging the tax. Due to individual state and local taxes, the exact rate you pay will vary widely by location. A gift tax is a one that is levied on the transfer of a property by one taxpayer to another while receiving either nothing or something with a less than equal value in return. Selling something at less than its full value, or making an interest-free or reduced interest loan, may qualify as giving a gift. All taxes levied by the government to plan for a taxpayer’s retirement could be considered retirement taxes. In the United States, we pay into a social security system that provides income to retired workers from the general fund. Our tax is regressive as we all pay the same rate up to a specific cap. Then all income above the cap is not taxed. An import or export tariff is paid when someone moves any good through a political border. Typically, it is used to “encourage” local businesses and “discourage” the purchase of foreign goods, as it increases the price for the foreign goods. Tolls are charged to drivers who cross through designated bridges, tunnels, and even some roads. They’re usually always paid in fixed amounts each time you drive pass through the restricted area. Tolls are frequently used to fund state projects, but can also be used for privately funded projects. How many of these taxes were you familiar with? Did any of them surprise you?